Last night, we went out for dinner at the Pine Tavern Restaurant. So named for the two pine trees growing through the dining room. Congratulations Ginny and Dave on your anniversary! 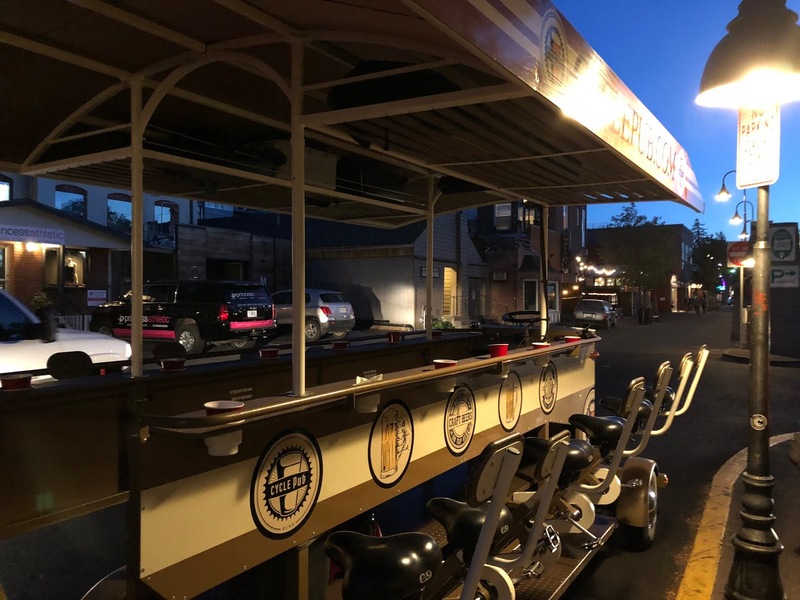 On the way back to the truck, we passed a pedal-powered bar. All of the patrons sitting along the sides provide the pedal power while the bartender is in the middle steering. An odd thing but apparently normal in this town of microbreweries. This morning, we stocked up on some groceries at the Walmart and Albertsons at the south end of Bend. 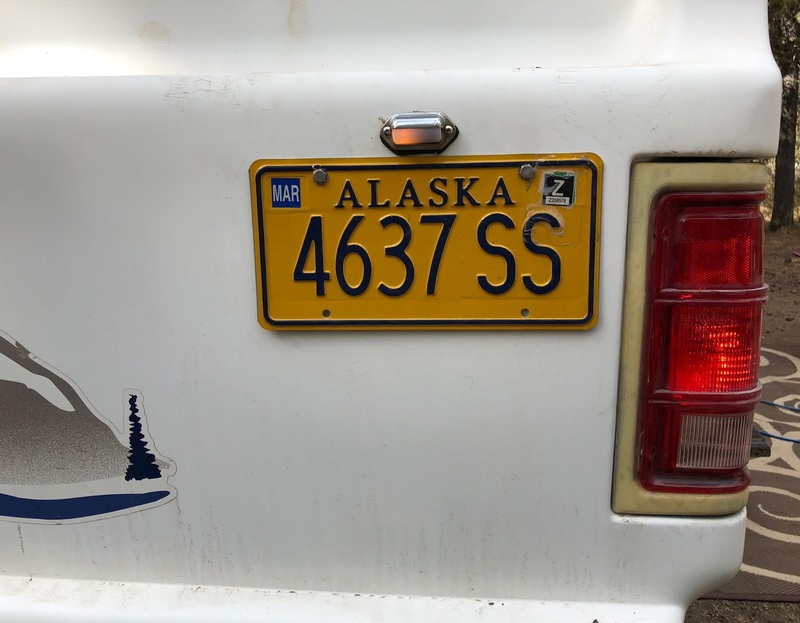 This afternoons project was sorting through the basement storage and relocating the trailer license plate and light next to the right tail light. This location was chosen as it was easy to get access to the back and ready access to taillight wiring. The wiring is old and corroded so it took longer to make the connections than anticipated. But I did manage to get rid of some of the Scotch Lock connectors. They were corroded and I'm surprised that they were still working. The new connections are soldered with heat shrink tubing. Too bad I couldn't find any of the heat shrink with a sealant on the inside. I filled the batteries back in May and this seemed like a good time to fill them again. 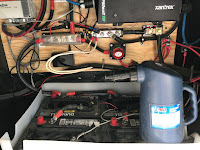 The battery fluid was about ¼" above the plates and all four batteries took about 3 quarts of distilled water. It's probably overdue for an equalization cycle but I'll need at least a day of full sun. The blue/gray pitcher is made specifically to fill batteries. You just insert the spout and push down which opens a valve to allow water to slowly flow in. The flow stops automatically when the fluid is at the correct level. Our campsite is mostly shaded as evidenced by the power output from the charge controller in this graph. It looks like very little power is generated except for about an hour starting at 11am.